Left: - Flashed Marigold LITTLE PIG Mustard Jar. 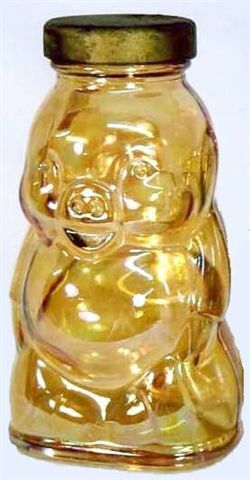 Right: - HONEY Jar with lid. KNIFE REST - Courtesy Remmen Auctions. PIG MUSTARD JAR, HONEY JAR, KNIFE REST : All these pieces appear to have been flashed with marigold, probably during the early Depression Era. 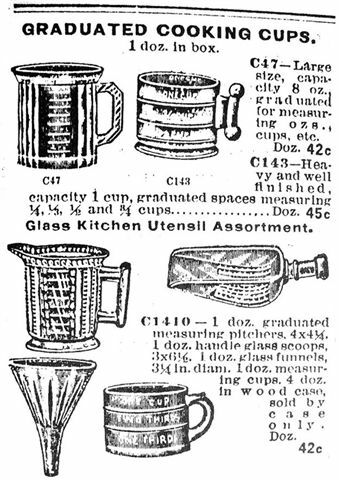 1908 Butler Ad and Measuring Cup. 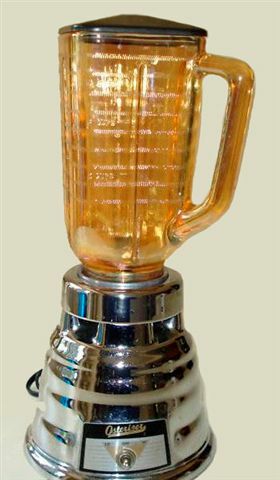 MEASURING CUP: Nothing in the Butler Bros. Ad to indicate other than clear glass production. Apparently “after-market” iridizing came into the picture very early-on? Left: - Lemon-Lime JUICER-1940s marigold. 2 5/8 in. width of juicer section. Right: - Lemon-Lime JUICER. 5.5 in. long, 3-3-8ths handle length, 14 oz. weight. 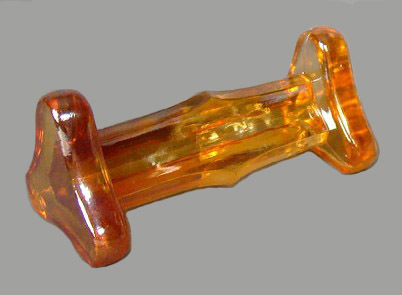 JUICE Extractors: It is difficult to determine whether these are amber in color, or have been iridized. 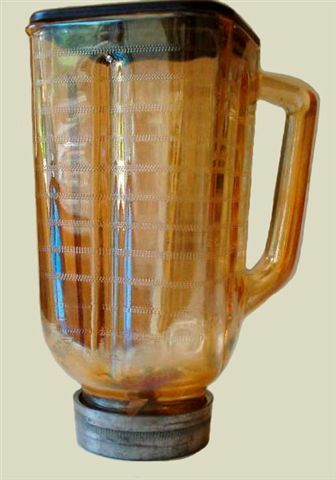 Would you prefer one such as this, or a clear glass “juicer”? Vintage OSTERIZER model 236. 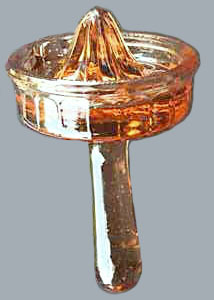 Series A with carnival glass pitcher. OSTERIZER: It would be interesting to know just when this model was introduced. 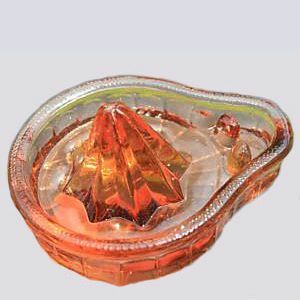 If you were in the market for such an instrument, would you prefer this one, rather then one having a clear top? 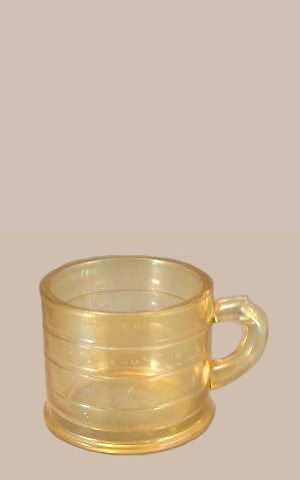 Contemporary Eye Cups - 2.5 inches tall. EYE CUPS: Hartung Book 9 describes these as “odd balls”. She mentions marigold and cobalt blue eye cups having been found. The drawing in the book looks nothing like either of these two examples, but then there is nothing to say that all members of the same family are similar in appearance. 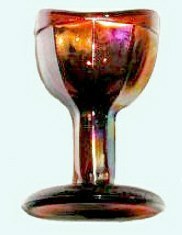 The eye cups pictured above were sold through Rosso, a wholesale glass dealer. 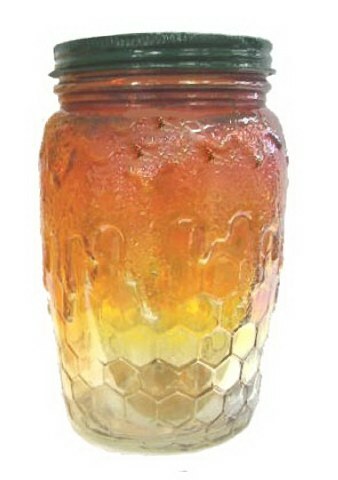 They were advertised as being American made glass but we are not sure of the maker. Rosso does not make glass. END of DAY Swan - $180. 4-10 - Courtesy Seeck Auctions. 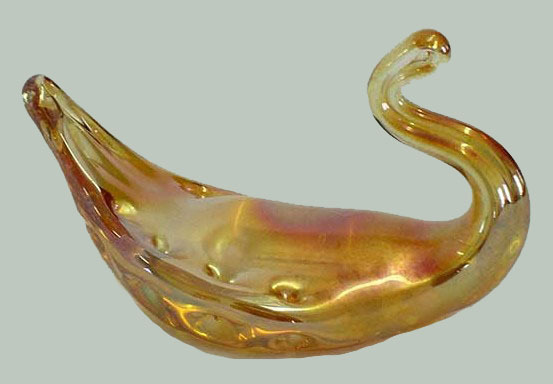 END of DAY SWAN: Reminiscent of much of the 1950s type “modern” glassware produced by Viking Glass in New Martinsville, WV. Everything that goes around, comes around again.